After my long day of hiking and driving around the Big Island I decided that I needed a day to just chill and be a tourist in the nearby touristy area of Kona. I started the day waking up at a reasonable time and partaking in a free breakfast in the club lounge of the resort. I then took my time getting prepared for the day donning my flip-flops and shades and heading down to my jeep. I left the resort and ventured down Ali'i (Hawaiian for royalty) Dr. towards the Kailua Bay area of Kona. My first stop was at the Magic Sands Beach Park (La'Aloa Bay Beach). I needed to at least dip my feet in the water in order to feel like I was actually on an island in the Pacific. I also checked out some of the lava rock formations where tide pools had formed just to see the life that was swimming around in those. I don't often see tide pools in Florida so they are always a bit fascinating to me. Anyway, I didn't have time to just dillydally and just waste my day looking at tiny fish dart around small pools of water (that is a complete lie as I had all of the time in the world). But I moved on down the road and found a place just outside of the main tourist strip to park my vehicle and I proceeded to walk on in. I stopped in an ABC Store which unlike the ones I'm used to (alcohol retail stores) is more of a convenience/gift store where I procured a Diet Coke™. I continued down the street taking my time to observe the local environment and window shop. I pondered why I saw so many indigent people and whether or not they were actually in a bad situation or just playing the part in a tourist-centric locale. It saddened me. I decided that I needed to absorb some of the local history so removed my flip-flops and purchased admission to the Hulihe'e Palace which was either a home or vacation home to many of the Hawaiian royalty. There were tons of artifacts and informational plaques throughout the home turned museum. It definitely showcased the Hawaiian royalty's conversion into more contemporary styles in both furniture and dress as part of the influence from Europe and American in the mid-19th century. Feeling a bit more enlightened I left the house and continued exploring the waterfront. I came across the Kamakahonu which seemed to stand out in this very touristy and resort laden area. Hunger struck me about this time and I decided that I would find a nearby place where I could look out on the bay and eat seafood. The Fish Hopper seemed to fit that bill. The food was good but not great. The total on the receipt on the other hand was a bit large. Oh well, I guess that sometimes happens when you are on vacation. Live and learn. After lunch I started heading back towards my vehicle while checking out the shops and sites that I skipped before. I also stopped in at a dive shop as I wanted to get a noise maker. Of course they were completely out of the kind that I wanted so I moved on. I got back to my vehicle and drove back towards my resort but I stopped at a couple of more beaches to see what they offered and to make mental notes of the ones I wanted to return to later in the week. I couldn't spend too much time as I had plans this evening so I rushed back to the hotel and got cleaned up. How could I come all of the way to Hawaii to do the tourist thing and not attend a luau (simplified spelling to make it easier for me to write). I registered and paid in the morning (and these events are not cheap by the way) and so I was all set for the evening's activity. The luau was supposed to begin at 7pm, if I remember correctly, but there was a huge downpour around 5-6pm. The report was that the rain was going to continue sporadically throughout the evening and into the night and therefore the organizers moved the luau indoors. Now for a small side-track. I've mentioned before that I have been playing a game called Ingress for the last four years. The game is worldwide and has players all over the planet. 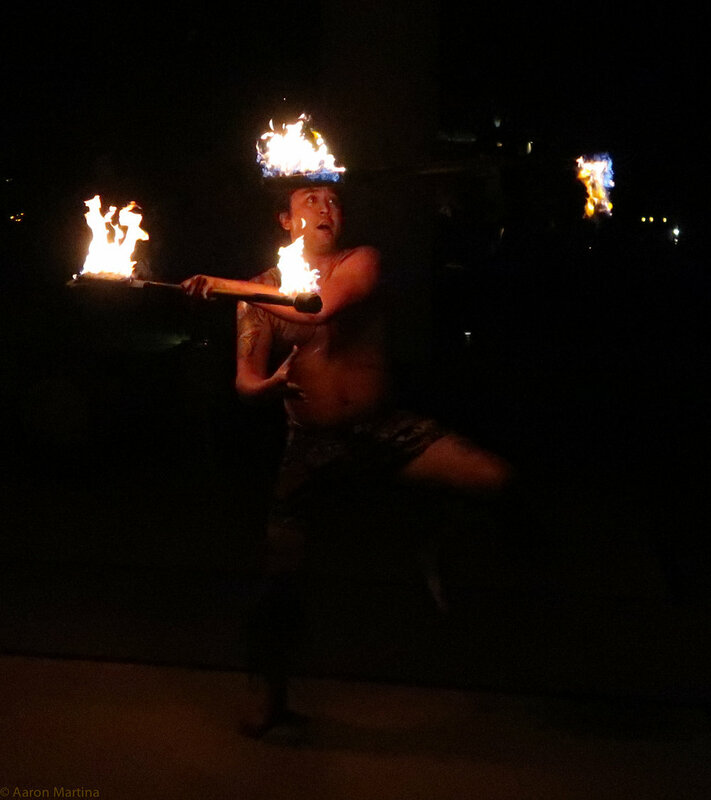 I had reached out to the local Ingress players that play for the same team as myself and to my surprise one of the people I talked to ended up being the fire dancer at the luau I was attending. We got to hang out for a bit before the event and I really enjoyed talking to him about Hawaii and Ingress. Back to the luau now. The doors opened and I got a shell lei as I entered. 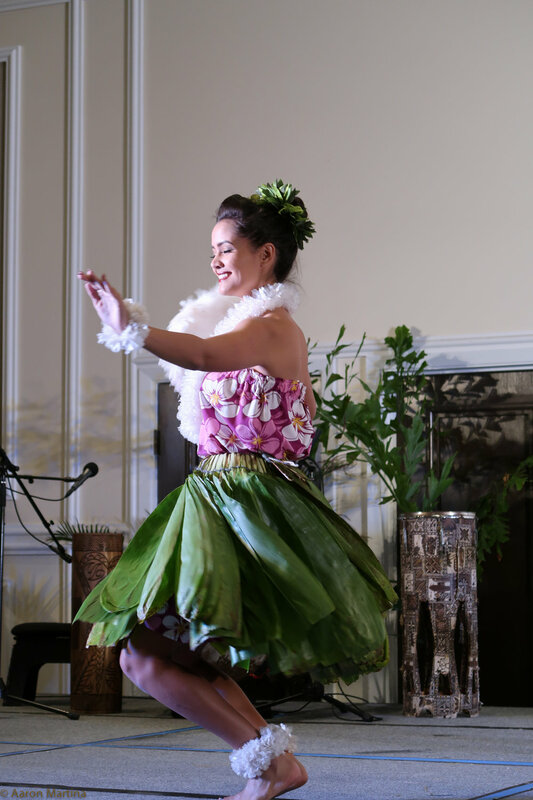 We were seated at large tables and then the MC took the stage (the first image in the gallery below) and introduced the guests to a bit of Hawaiian culture. The music, costumes, history, and hula dancing were amazing. The food was good and I believe I tried everything. The luau finished with the fire dancer set against drums and chanting. I enjoyed the entire event.